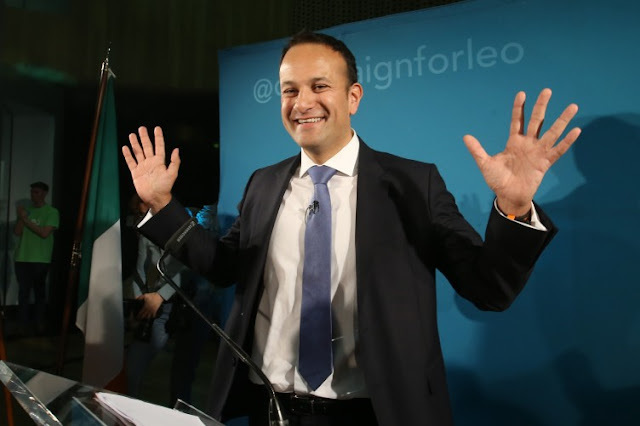 Ireland has just elected its first gay Prime Minister. 38-year-old Leo Varadkar (b. 1979) will become the youngest ever Taoiseach* and the fourth openly gay world leader, after Belgium, Iceland and Luxembourg. However, Varadkar must wait until Tuesday, June 13, before formally being appointed Taoiseach under Ireland’s election method. The Dubliner previously served as the Minister for Social Protection and Minister for Health, and was first elected to parliament at the age of 27. “If my election...today has shown anything, it is that prejudice has no hold on this republic,” Varadkar said after his victory was announced in Dublin yesterday. He is leader of the ruling Fine Gael party and will become Ireland’s first Prime Minister from a minority ethnic background. Varadkar’s father Ashok, who comes from Mumbai, met his Irish mother Miriam while they both worked at an English hospital. Dr. Matt Barrett has been Leo’s partner for two years, and both are fitness enthusiasts. Leo studied medicine at Trinity University (Dublin), so both Matt and Leo are qualified medical doctors. Prior to the election, Leo had stated that he would not expect Matt to accompany him on official government business (the couple are not married). Varadkar is now one of two openly gay world heads of state currently in office – Luxembourg’s prime minister Xavier Bettel is the other. Other previous world leaders were former Belgian Prime Minister Elio Di Rupo and former Icelandic Prime Minister Jóhanna Sigurõardóttir. In 2015 the Republic of Ireland became the first country to pass gay marriage by public vote. *Pronounced “TEE-shocks”. It means “chieftain” or “leader” in Irish. Outside of Ireland the term Prime Minister is used.